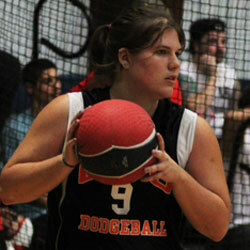 Issue 4 :: Dodgeball, Sexist? Recently, an article was published in the April issue of Obscure Sports Magazine (OSM) that questions whether dodgeball is a sexist sport (1). The premise for the discussion is that when men block for or shield a woman, relegate female responsibilities to collecting balls for the men to throw, or include a smaller ball size, men are perpetuating the social stereotype that women are the weaker gender. First, I think it's important to distinguish between sexism and skill. In my experience with the NDL, both at the Dodgeball World Championship (DWC) and in the Pros, I have not witnessed these scenarios in the form of sexism. I have seen teams designate blockers, and provide balls to those with stronger arms, but I believe these are team strategies that are transferrable between males/females based on individual talent. If a female is a skilled blocker and blocks for a man, or if she is a strong thrower and a guy provides her a ball to attack with, it is because she has proven herself in these areas and the team is utilizing her strengths. This strategy remains applicable if the genders are reversed. Do male athletes usually throw harder than female athletes? Perhaps. Does this mean women can't throw hard? No. As the wise Rob Immel will say, "It's not called throwball!" 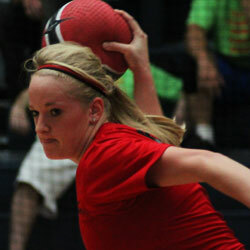 A complete dodgeball player can dodge, block, and catch too. These skills require hand-eye coordination, agility and reflexes to which both men and women can achieve equal levels. 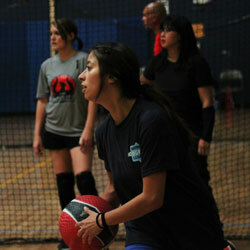 This makes dodgeball unique when compared to other co-ed sports such as flag football or soccer, where physical size, strength and speed present more disparity. The NDL does offer multiple divisions at tournaments with varying ball sizes and/or types. Our big ball, stinger, recreational and no-sting divisions reflect popular demand and permit players of both genders to choose the division that fits them. One of the greatest characteristics about sports is they allow people to look beyond color, gender and cultural differences to see teammates and opponents as equals; judged only by what they offer as athletes and human beings. Think Jackie Robinson in baseball, Julie "The Cat" Gaffney in "The Mighty Ducks 2", or stopping a war for a soccer match. When we step onto the dodgeball court, we follow in their footsteps and lead by example.